today...hop on over to check out all of the details! I started with a piece of Mixed Media cardstock, perfect for any kind of ink, spray, or paint. I used Distress Markers, a water brush and my non-stick craft sheet to add color to the background (and it appears that I'm still a bit obsessed with pink and grey). I scribbled ink from the marker on the non-stick craft sheet and then picked up the ink with the water brush. Then I just swiped the brush over the cardstock. I also used the oval shape from the Spotlight Frames and Mask set to create a mask on my background, which I then traced with a black Fude Ball pen. I then used the oval shape frame to act as a mask for my background so that I could stencil the Sunburst shape and keep the burst within the border on my frame. 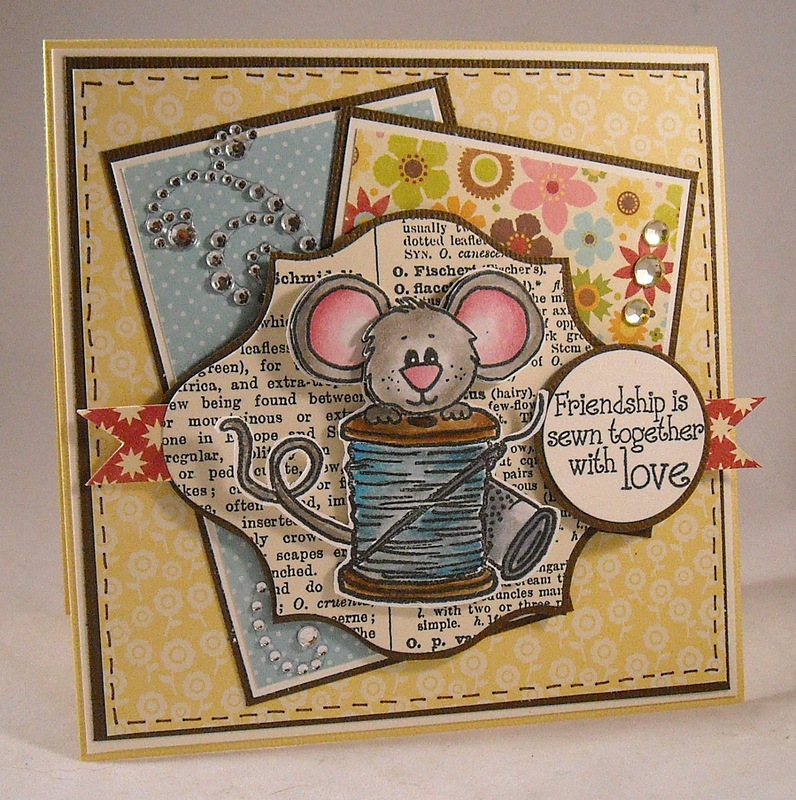 I then stamped the sentiment and swirl from the Paper Doll Art stamp set. My card features spot embossing, meaning that instead of embossing a large area I'm only embossing a portion of a larger piece. You can see my Watering Can embossed lines at the top and bottom of my card. Next, I used the new Tiny Shapes Movers & Shakers dies (aren't they the tiniest, cutest dies ever!) to die cut a few embossed butterflies. For quick and easy die cut embossing, I first added some Distress Ink to a scrap piece of manila tag and then used clear embossing powder. Then I just die cut the shapes out of the already embossed tag! You can see that I embossed the butterflies, my gal's apron, gloves, and lips. This was done by first stamping or coloring the image and then using a VersaMark pen to color over the area that was embossed, I used clear powder for these areas so that the colors would show through the powder. You have a bit more than 24 hours to enter the challenge, and this month I'm giving away some free Wendy Vecchi goodies to a random entrant! Head on over to the Make ART blog and join in on the fun! I'm sharing a Gelli Plate project over on the eP blog today...Hop on over and check out all of the details! I'm hanging out with the Sweet 'n Sassy gals today...Head on over to the blog to check out all of the details on today's project. Enjoy! I opted to celebrate the great outdoors with my card, that I did in fact make for my hubby for Father's Day. I started by using Distress Ink and a blending tool to make my sunset background. Then I just needed to stamp the tree image from the Tender Thoughts stamp set on my background. The deer was stamped on a piece of scrap paper and fussy cut, then attached with foam tape. The sentiment is actually from the Birthday Word Art stamp set (I added Happy Father's Day inside the card). And since the tree image is large, I used a whole bunch of paper layers for design on the card (along with one piece embossed cardstock). Hope you enjoy today's hop and wishing all those dads out there a Happy Father's Day! Hiya, strangers! I have a photo tutorial to share with you today...that's right...I crafted AND I'm blogging about it! LOL! This art journal page was inspired by the 2015 Lifebook classes. Let's get started! This is a small art journal, created by Donna Downey, size is 6" x 9". I started by covering both pages and the inclusion with Tim Holtz tissue wrap. I used Matte Medium for all of my gluing. I used Distress Paint to cover both pages and the inclusion. Distress Paint is great for art journal backgrounds! The transparent nature of the paint combined with the thinner consistency makes for easy spreading, shading, and color. I added a bit of texture using embossing paste (this is Wendy's white paste mixed with black gesso) and stencils from the Crafters Workshop. I then added my designs, two giant poppies (designed by Donna Downey) to one of my pages. Both were stamped in Archival Ink. Stamping the designs first gave me guidelines for my collage. Next...collage! I used designer papers, all with red being the main color, and torn into small pieces. More matte medium and lots of pieces of paper later, and my flowers were created! I used a stamp positioner to restamp the poppy images so that flower design was still visible. I also added black collaged paper for the middle of each flower and green for the stems. You'll notice on my finished piece that I got rid of that dark black, embossed text. It was too stark so I mixed gesso with some whater to whitewash over the black text. A baby wipe helped to blend the whitewash into the background and allow just a hint of the black to shine through. 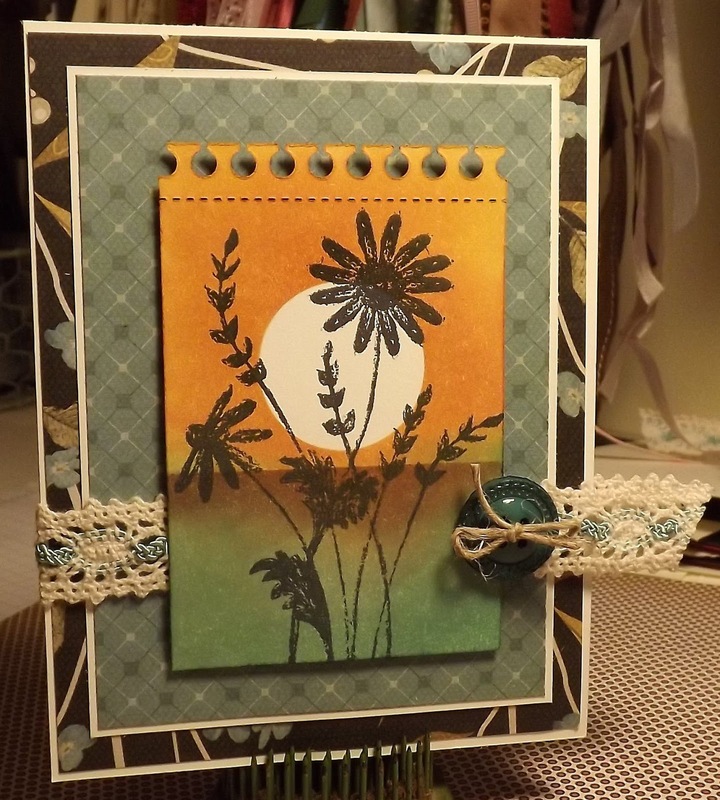 I added a bit of stamping (the crackle design) around the edges and on the inclusion, along with some shading around the flowers and on the art journal edges. The quote was added using two Tim Holtz alphabet sets (just a little twitchy that my "pl" is a crooked...arrgghhhh) and highlighted with a white gel pen. Both sides of the inclusion got just a hint of stamping (more Donna Downey designs) and a few quotes from one of Tim's word books. That's it for me today, friends, hope you enjoyed the tutorial!